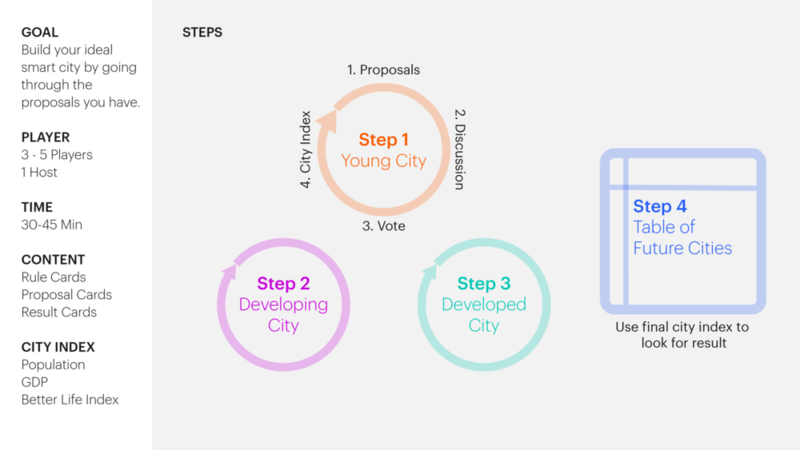 Proposals is the game which aims to facilitates conversations between citizens about the idea of smart city and the implication of data privacy. WHAT CITY HAVE YOU BUILD? We can use this game to facilitate conversation about the smart city and data privacy successfully. But there are still some minor points to be addressed in the future. With limited time to deliver the project, our team is only able to conduct one playtest session and one iteration. I believe more playtests and iterations will be required to fully achieve our goal which is having meaningful conversations about data privacy in the context of the smart city. The content we have developed has served as a good starting point for the conversation. However, due to the limited understanding of data privacy from players, the discussions often start with shallow understanding. A in-depth facilitation guide will need to be developed to help the host make the conversation more meaningful. To read more detail about this project, please check here.